"Days of separation are over; night of wait is coming to an end; our friendship will stay forever," said Prime Minister Narendra Modi quoting Persian poet Hafez, adding the agreement to develop the Chabahar port in Iran will strengthen our ability to stand against those whose only motto is to maim and kill innocents. Speaking at the trilateral summit in Tehran, PM Modi described the deal as 'historic'. "To build bonds of connectivity is the most basic of human urges. Today, we seek to fulfil it," said PM Modi. "The agenda for economic engagement is a clear priority for us. We stand together in unity of our purpose," he added. The PM said to carve out new routes of peace and prosperity is the common goal of India, Iran and Afghanistan. "We want to link with the world. The agreement on establishment of a Trilateral Transport and Transit Corridor signed a while ago can alter the course of history of the region," he added. He also said that this corridor would spur unhindered flow of commerce throughout the region. PM Modi further said the reach of the Chabahar port could extend to the depths of the Central Asian countries. "Afghanistan will get an assured, effective and a more friendly route to trade with the rest of the world," he added. Describing the importance of Chabahar port, the PM said this corridor would spur unhindered flow of commerce throughout the region. "The inflow of capital and technology could lead to new industrial infrastructure in Chabahar. This would include gas based fertilizer plants, petrochemicals, pharmaceuticals and IT," he said. "The key arteries of the corridor would pass through the Chabahar port of Iran. Its very location, on the mouth of Gulf of Oman, is of great strategic significance," he added. 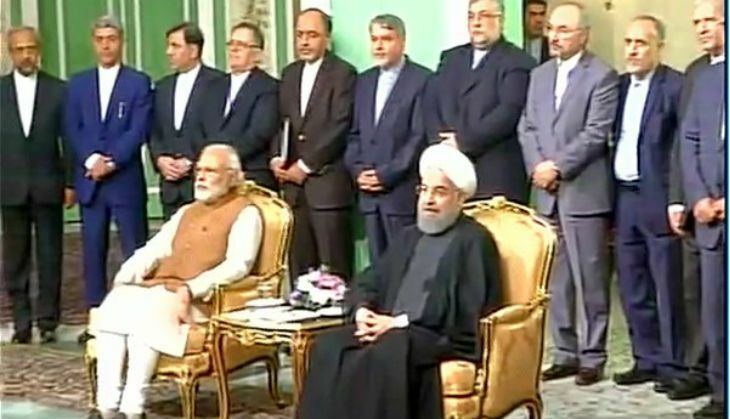 Reiterating his earlier assertion, PM Modi said the 'dosti' between India and Iran is as old as history.